Well, Novica graciously offered me a gift code to pick something out for myself to review! For anyone not familiar with Novica, here is some info from their website. "We want to give artists and artisans around the world a global platform to express their true artistic talents and to spur their creativity. And, we want to provide you with access to unique, hard-to-find items at great values that only the Internet infrastructure can allow. In the spirit of the Internet, let us bring you together. NOVICA. The World is Your Market." "My father was a jeweler and I was highly inspired by him. I grew up watching him make amazing jewelry with his own hands and this really fascinated me. "In traditional Indian families, it is not easy for a housewife to start a design workshop, but I was fortunate that my husband also shares the same interests. 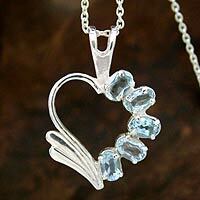 Together, we create beautiful jewelry...."
The necklace is really nice. I can wear it to Church and dressy events, or with casual, everyday clothes. Novica also carries much more than jewlery, and I recommend checking it out! Whether you're looking for a unique gift, or just want something for yourself, Novica offers a great variety of items from many different countries!